Venus Freeze is a quick, non-invasive treatment that is highly effective in reducing circumference, improving cellulite, tightening skin, and reducing the appearance of wrinkles. Eyes, Face, Neck, Decollete, Arms, Abdomen, Flanks, Bra-line, Buttocks, Hips and Thighs. What kind of results will I get? Tighter skin, softening of wrinkles, plumper, fuller more youthful appearance, reduced cellulite and more contoured silhouette. Is there any downtime? Can I do a treatment at lunch and return to work right away? Absolutely! A treatment to one area takes less than 30 minutes. 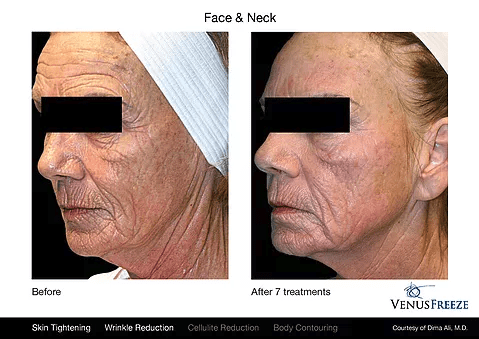 Schedule a Medical Consultation today to see if Venus is right for you!